This term, the middle school history students made some big decisions about survival, whether to hunt or gather and whether to follow the mammoths or just stay put, in order to stay alive! They were playing a cooperative simulation game created by Finlay Logan, history teacher, along with her co-teacher, Katie Steen. As the students learned about the lives of prehistoric people, they grappled with concepts such as adaptation, migration and survival. They learned how environmental conditions, such as landscape and drought, impacted a group of people’s ability to survive. One goal of the lesson was to help students understand what it was like to live in a hunter-gatherer society. Prehistoric people needed food. Food provided energy to find more food and to move to explore the landscape. Finlay realized that these were concrete ideas that could be simulated in a board game and they set out to create sets of hunting and gathering cards, game boards representing different landscapes, and game pieces to represent prehistoric people and migrating mammoths. Through game play, they wanted the students to understand how precarious survival was at that time. With drought, wildfires, animal migration and over-gathering, conditions for survival were unpredictable, just as they were in the game. In the game, students spent “energy cubes” to go hunting or gathering. For example, when they chose to “hunt,”, they drew cards from that deck to reveal some of the animals that prehistoric people may have hunted, such as deer, rabbits, and the biggest food yield: the mammoth! If they were able to acquire enough food points to keep their tribe alive before spending all of their energy, they could then trade those food cards in for more energy and begin the next generation. The goal of the game was to keep your people alive for as many generations as possible. 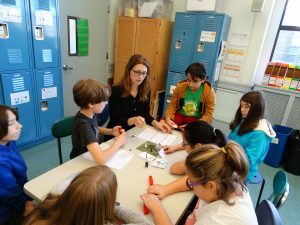 Once Finlay and Katie introduced the game, the students were immediately engaged and making connections. They discovered that gathering in the forest is easier than gathering in the scrub desert, as it required less energy and yielded more food! Hunting one mammoth could keep your tribe alive for a turn! Moving from place to place required energy. If you spent it all on the move, you wouldn’t have any left for hunting or gathering! Finlay’s hope is that this experience will help the students appreciate the importance of the invention of tools and farming in the Neolithic Era, the development which enabled the formation of the ancient Egyptian and Greek societies, and will be the next era of study.